An incredibly important bag to The League for multiple reasons. The folklore and tales of the phoenix rising tells us the phoenix represents re-birth. For the League, it represents much more. 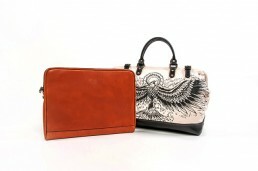 This bag represents letting go of everything in order to fulfill one’s full truth and destiny. Not only rising from the ashes, but also to live only by the principles important to the League—speaking your truth and having the courage to live one’s life with wisdom and integrity. To The League, to let the phoenix rise is to let the lower self, human embodiment, die, so that the true spirit can rise from the ashes. The artist whose work is featured on this bag, Adam Razak, is the original Gentlemen’s League artist who Stevens started with in 2008. It only made perfect sense for the re-launch of The Gentlemen’s League to be with the League’s original artist. 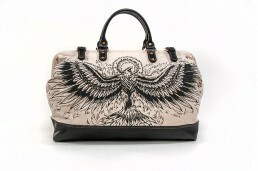 The front of the bag features the Phoenix Rising high and centered. 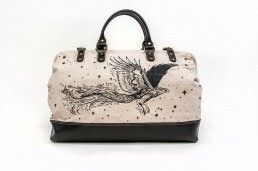 The back of the bag features a side profile of the phoenix flying among the stars.